Our weight-loss services focus on helping you lose weight sustainably – call us on 087 930 7575 to find out how we can help you! 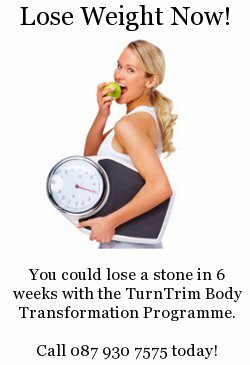 TurnTrim services will help you lose weight fast – and keep the weight off for good. Depending on your personal weight-loss goals and individual preferences, we have a service that can help you. Click this link to find out more about our Body Transformation Programmes, or call us today on 087 930 7575. If you require a private and intense weight-loss service, our one-to-one weight loss coaching is an ideal solution. You’ll attend our Sixmilebridge clinic, where we’ll work closely with you on a personal basis to help you achieve your weight loss goals. The service is highly personal. We work with a strictly limited number of one-to-one clients, and you’ll work directly with one of the Founders of TurnTrim. For more information, see our One-to-One Weight-Loss Service Page. Our weight loss & exercise classes provide you with a way of toning up and losing weight without breaking the bank! The classes include a scientifically designed fat-burning exercise session (work at your own pace!) along with a weigh-in and weight-loss coaching session. Our classes are suitable for all shapes and sizes – so come and work out in a friendly and supportive environment. At €10 per session, our exercise and weight-loss classes are superb value for money. Find out more about our Weight Loss & Exercise Classes. If you’d like more information about our services, contact us online or give us a ring on 087 930 7575. We love to talk about weight-loss! Pingback: Losing Weight: Think Positive and Achieve Your Weight Loss Targets!